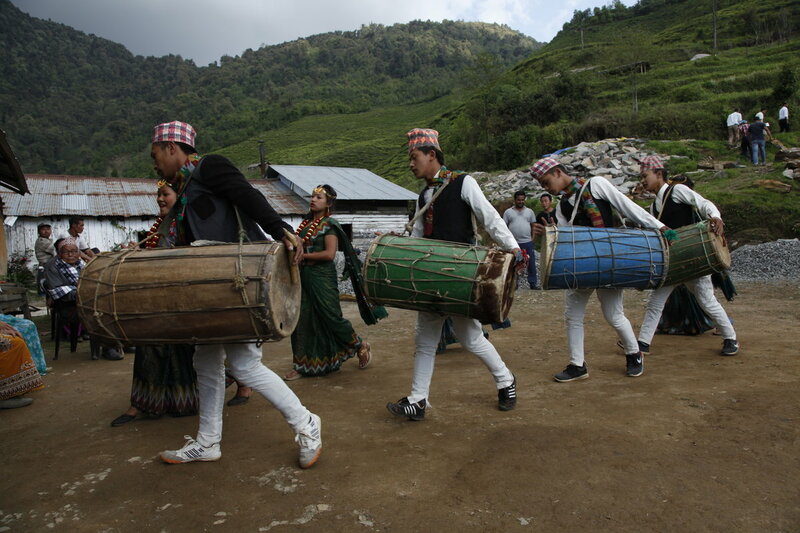 In the Himalayas, people love music. Whenever the opportunity arises, they take up their instruments – sometimes a guitar, sometimes something more traditional – and they sing and dance. Here, with the Limbu people, everyone is wearing traditional dress to celebrate my arrival. They played and danced until the last rays of the setting sun, overlooking magnificent mountains. Later, they lit the fire. It’s a moment of pure happiness. Divinities differ from country to country, and while some people are celebrating Christmas, on other continents they worship Shiva, or pray to Allah, or follow the words of Buddha. Through my work I’m lucky to come across people from different cultures and religions, and I love this variety. Happily, we don’t all think the same way yet; our customs and rituals change and we speak different languages depending on where we’re born, and I hope this continues as long as the world exists. It makes travel more interesting. Some people follow a religion, others don’t – although the latter are rare in the parts of Asia and Africa I visit. Among them, I find a multitude of different rites. People pray before a wall, from a pulpit, at the foot of a minaret, or around a stupa. 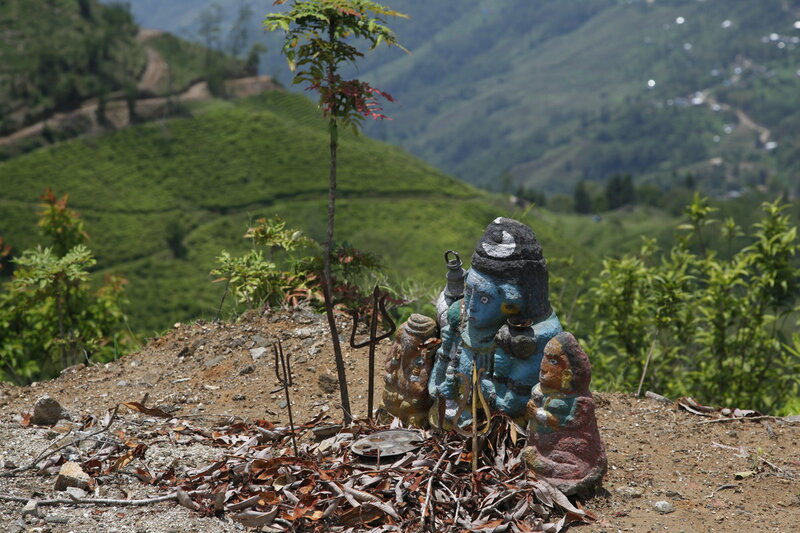 They pray to the wind or fire, they place offerings at the foot of simple statuettes. Whoever or whatever you pray to, and even if you don’t pray at all, I wish you all happy holidays! I like silence. I hate it when people make noise for no reason. I don’t have a television. I don’t see the point of listening to music constantly. I’ve noticed that many people are afraid of silence. They go around with headphones on, they talk even when no-one is listening, their thumb constantly swipes their phone screen. They are filling a void that feels threatening. But what is there to be afraid of? I’m happy with silence. I’m happy surrounded by nature, away from human noise. It’s the same with photos. A good photo needs no commentary. No noise. You can just look at it. A few days ago, while walking in a remote part of Nepal on a track that winds through hamlets and tea fields, I remembered my first trip to this country a little over ten years ago. I remembered the curfew, the war, the ban on driving at night, the fearful army who pulled your vehicle off the road, made you get out and pointed an automatic weapon at you. I remembered the Maoists who held villagers to ransom, who took their belongings if they couldn’t pay their taxes, and sometimes even one of their sons. I remembered stories of executions, a father or mother in tears. I remembered all this pain, and now, on this little path surrounded by glorious nature, I thought that sometimes we forget to be happy, we forget to see the good things. It’s easy to spend your life lamenting, as if everything was so much better before, as if everything is going to ruins, when sometimes the world is improving. It’s a shame not to think about this, to forget to be happy. So I stopped walking, looked all around me at the incredible landscape in this peaceful country that has put war behind it. I took my time to appreciate it and to feel thankful. Sometimes the world is beautiful. In Nepal, the effects of the earthquake are ongoing. Whole villages are still in ruins, their inhabitants living among these ruins, in houses that have half-collapsed, covered over with a tarpaulin for a roof. 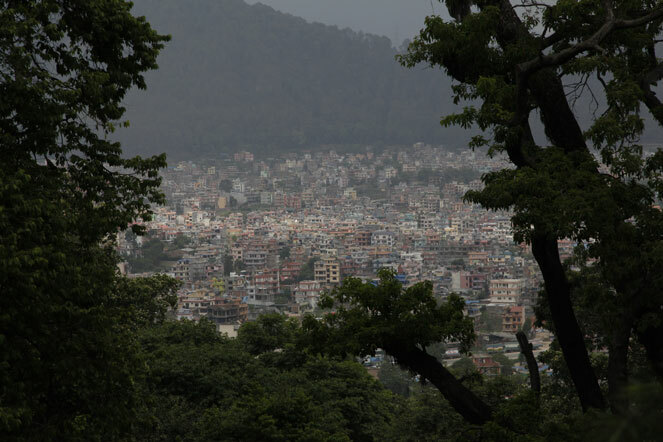 In Kathmandu, only the old town was affected. There too, there is no sign of reconstruction. A significant number of the capital’s most beautiful monuments have been reduced to dust, and surrounding houses are in a fragile state. 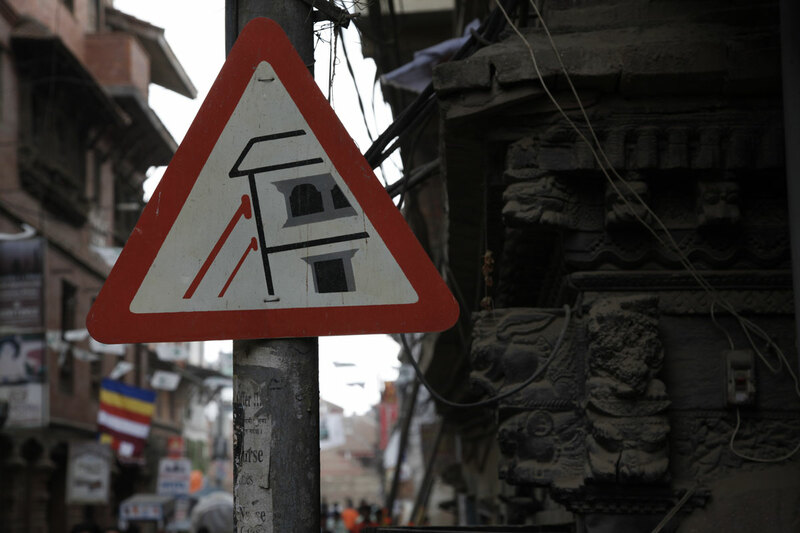 While they await repair, they are being propped up by wooden struts, and signs warn people of the risk of collapsing buildings. When we taste tea, we pay attention to the leaves at every stage. Of course we are interested in the liquor, which we drink, and we also examine the dried leaves: are they whole or broken? Do they contain buds? What colour are the leaves? Are they all similar? Lastly, the infused leaves can tell us a great deal. We smell them, and press them, as Nirananda Acharya is doing here. Often, the smell of the wet leaves can tell us as much about the tea as drinking the liquor itself. The wet leaves inform us about every stage of the processing. We can pick up on the slightest defect, or on the contrary, we can revel in the wonderful bouquet. Indian tea producers are complaining about unfair competition from Nepal, and I don’t buy their argument. They don’t complain that Japan, China and other countries produce tea, they have to deal with it. But with Nepal, India is behaving as if it could put pressure on this country, which has no access to the sea, to impose conditions, make it pay taxes, and in this way prevent it from exporting its tea. Nepal is a particularly poor country which buys most of its consumer goods from India, and is therefore dependant on India to a certain extent. India is using this to its advantage. 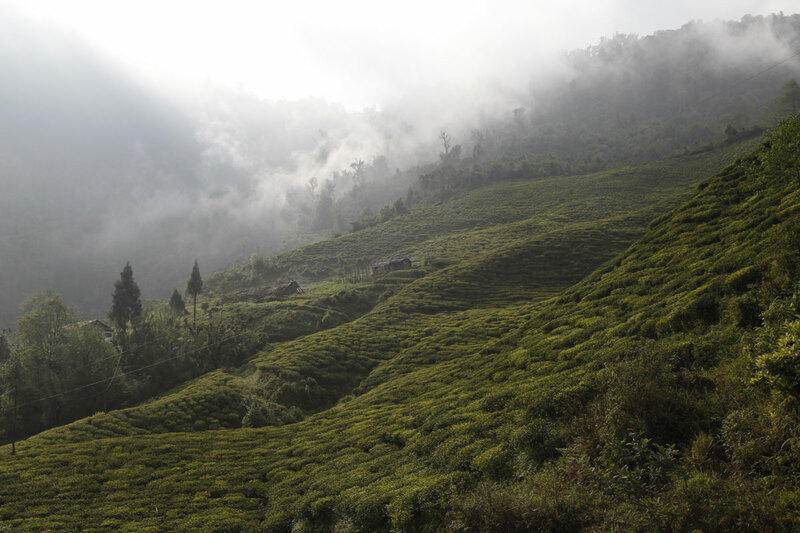 Among the complaints levelled by Indian producers, particularly those in Darjeeling, is that Nepalese teas create unfair competition for Darjeelings. 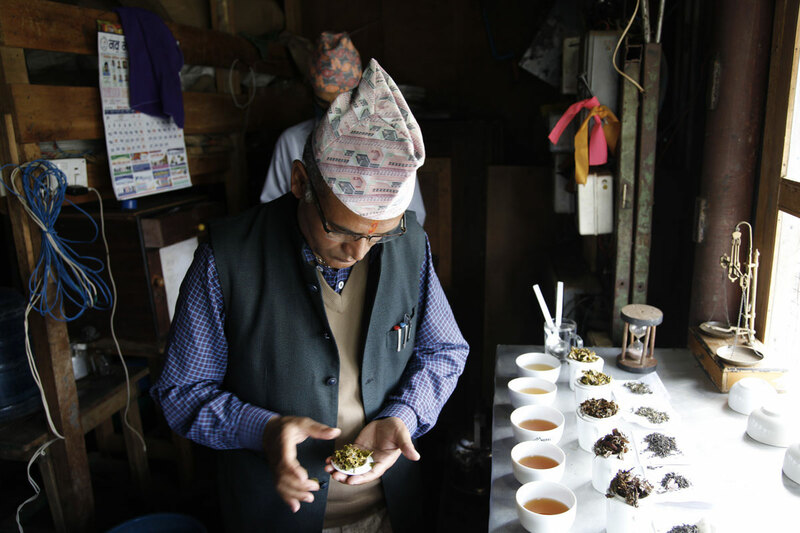 But to my mind, Nepalese teas have their own character, they are recognisable, they don’t need the prestige of Darjeeling to enjoy success. They offer excellent value for money, much better than Darjeelings, and it is most likely this which is irritating India most. 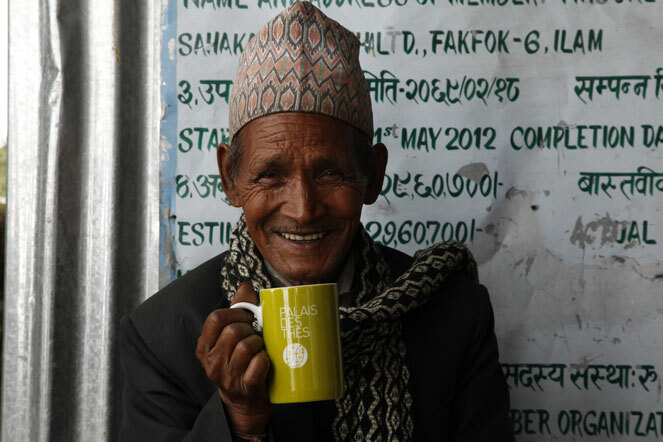 Lastly, and this is a positive thing, Nepal is starting to build a good reputation for itself in tea. This is a great improvement on the dodgy dealings that have been going on for years with certain unscrupulous Darjeeling gardens, who bring in fresh tea leaves from Nepal at low prices, process them in India, and then pass them off as pure Darjeelings! The preparation for a tasting is a special moment. I watch what my host is doing, each precise movement. The leaves are presented on a base that allows you to see them, then the tea is weighed out to the nearest tenth of a gram, before being steeped for a specific time. 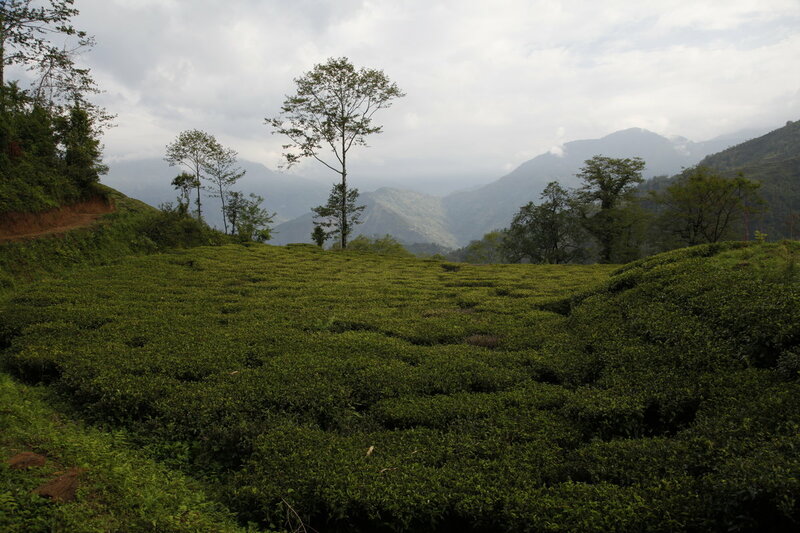 Each tea must be brewed in exactly the same conditions. Before tasting the tea, while the liquors cool a little, I like to take a few photos of the room itself, of people going about their activities, their faces, or the landscape. I often make use of windows. The reflections can be unexpected. I take photos through the window, while others look on, puzzled. 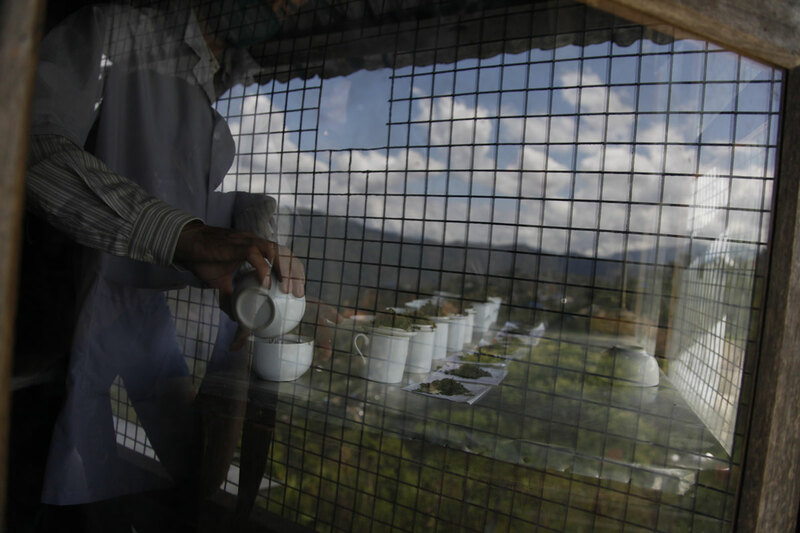 Here, at the Kanchenjunga Tea Estate, through the grille-covered window, you can see the tea being prepared against a background of mountains and the tea garden. I met Rana Bahadurdiyali a few days ago in Ilam valley, in Nepal. Twenty-four years ago, Rana founded the co-operative Teenjure, which today has no less than 234 farmers who combine their tea production. This year, Teenjure has started to produce some very good, interesting and varied teas. 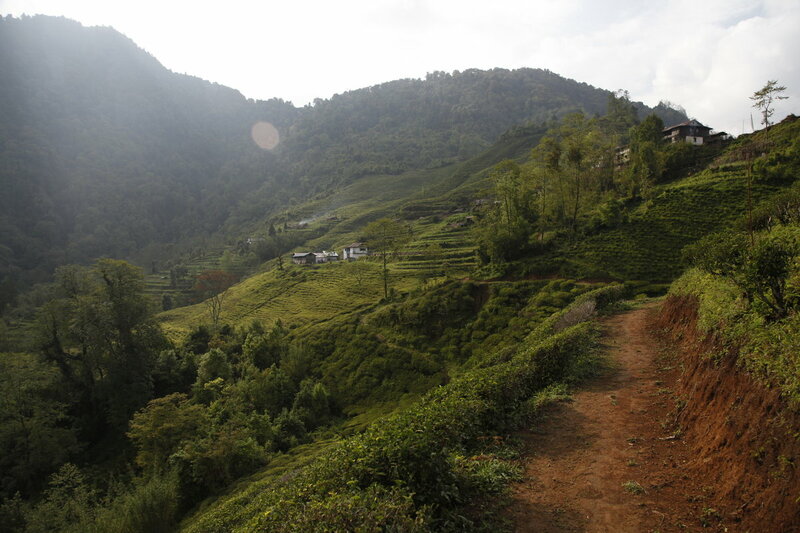 When I asked Rana what he wanted me to write about him, he told me how hard everyone had worked, how challenging it was for the whole community of Teenjure to start growing tea – clearing the land, planting the tea plants, building the factory and installing the equipment. Twenty-four years ago, when they began this project, they had no water, no road, no electricity. It took them two years to build the factory, Rana, aged 82, tells me, smiling. I’m writing from the Nirvana Garden Hotel in Kathmandu. In Buddhist culture, “nirvana” means a state of bliss. I find it in the country’s mountains when I drink sublime teas in a protected landscape, often made up of jungle and neat rows of tea plants. The harmony between the experience of tasting and the contemplation of nature fills me with happiness. Tomorrow, I’m leaving for the Ilam valley in the east of the country, to visit farmers I already know, and meet some new ones.